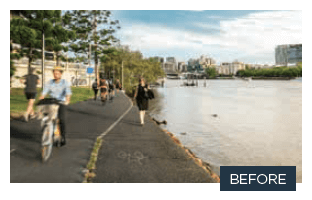 From mid-2018 to mid-2019 the Bicentennial Bikeway from near the Goodwill Bridge to the back of 1 William Street will be under construction. When complete, the 500 metre section of bikeway will be widened to 3 metres, with improved lines of sight and the removal of dangerous pinch points. Parallel to the bikeway will be a dedicated 2-metre‑wide pedestrian path and an accompanying Mangrove Walk that will be constructed in the river as a scenic walk for pedestrians. 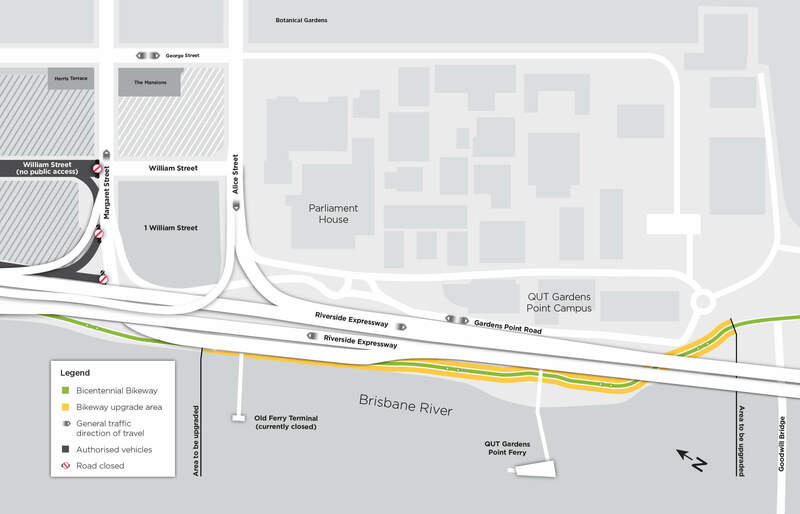 To enable this construction to occur the bikeway will be closed from the Goodwill Bridge through to the back of 1 William Street (near the old ferry terminal no longer in use). An alternative route for the duration of the work is in plan. Details will be made available before it takes effect. To stay informed about these changes please subscribe to our construction updates by clicking ‘stay informed’ on our project website www.queenswharfbrisbane.com.au. The highlighted section of the Bicentennial Bikeway (shown below) will soon be under construction. An alternative route will be offered for the duration of the work with details still being finalised. For more information visit our website www.queenswharfbrisbane.com.au.